It is the mission of the Faulkner County Conservation District to protect, maintain, and enhance our natural resources for now and future generations. We will strive to position ourselves to provide technical assistance and guidance to all customers in the District on the wise and efficient use and conservation of soil, water, and related natural resources. It is our goal to provide an avenue through which all who are interested may come to identify and solve problems relating to natural resource issues. We pledge to be an influential presence promoting best use and conservation of the natural resources in our county. The easiest way to approach natural resources management is at the watershed level. A watershed is a defined area, like a county boundary, that includes high ridges and low valleys. Typically, it is the general drainage area for a group of water bodies like streams and lakes. Watersheds are organized by hydrologic unit codes. In Faulkner County, we have four 8 digit Hydrologic Unit Code (H.U.C.) watersheds. 8 digit H.U.C. 's are the largest watersheds that we use for land management. 8 digit H.U.C. 's are typically around 400,000 acres in size. 12 digit H.U.C. 's are the smallest (~25,000 acres) and make-up the boundaries for an 8 digit H.U.C. like pieces of a puzzle. The four 8 digit H.U.C. 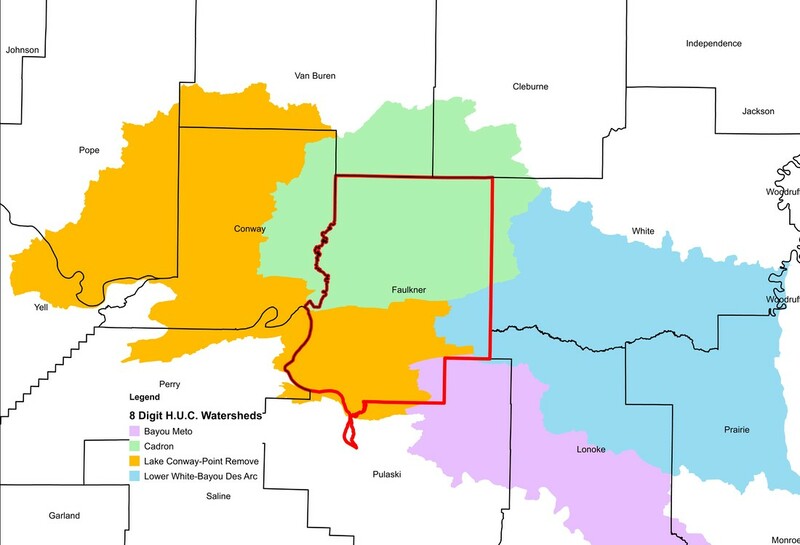 watersheds in Faulkner County are the Lake Conway-Point Remove Watershed, the Cadron Watershed, the Bayou Meto Watershed, and the Lower White-Bayou Des Arc Watershed . They are pictured in the map below. Click on the image below for county information from the University of Arkansas Cooperative Extension Service.